We not only say "dog tired" in English to mean we are very tired, we also can say "it's a dog's life", which certainly describes this photograph! 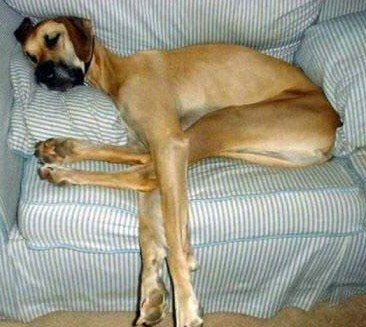 This dog really looks relaxed, doesn't he? 1. When do you feel this relaxed? 2. Have you ever felt "dog tired"? 3. Would you like to lead "a dog's life"? Why or why not?